Humour me for straying from chocolate once again. 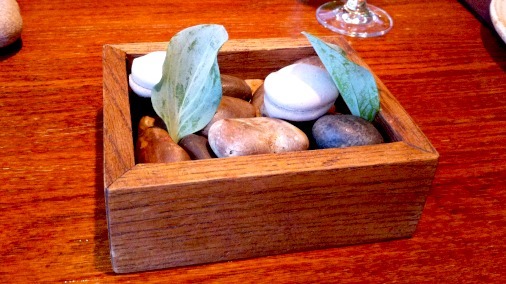 L'Enclume was an experience too special to keep to myself. 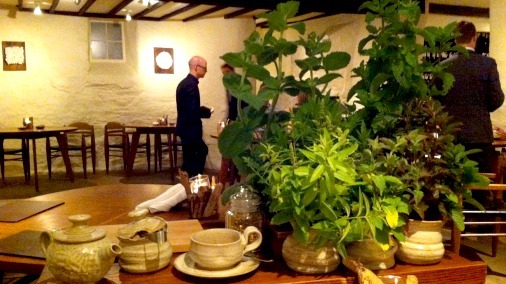 L’Enclume, Simon Rogan’s two Michelin starred restaurant in the village of Cartmel, is hardly on the beaten track. It occupies the old blacksmith’s (enclume is French for anvil) in the heart of a Cumbrian village carved out of characteristic grey stone, nestled in amongst the hills of the Lake District. But while it may not be a place you are likely to wander past, it is absolutely worth the journey, consider it a pilgrimage. I have been hoping to go, planning, since Simon Rogan intrigued and delighted me during his performance on Great British Menu in 2012. The particular innovation of his food, with its freshness, purity to his local English ingredients, and attention to detail was captivating, and now that I have tasted it, is quite as stunning in flavour as could be hoped. 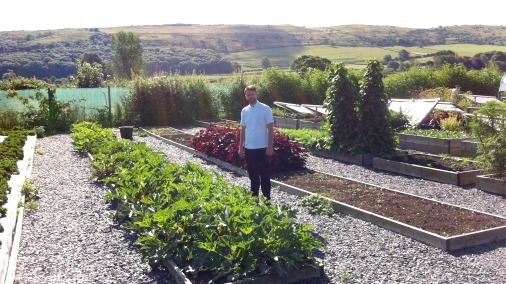 Mark Birchall, L’Enclume’s head chef, among his palate of possibilities. I was fortunate enough to pay a two night visit, which allowed me both the all important dinner at L’Enclume, but also plenty of time to explore. Thanks to the great generosity of Head Chef Mark Birchall, I was given wonderful insight into the food, the kitchens, and how he makes it all work so gloriously. Mark, who hails from Chorley near Preston, and has been at L’Enclume for 8 years, presides over the newly built kitchens, and a team in which he clearly takes pride. There is calm and order here, and in Mark, whose prior experience includes a formative stretch at Northcote Manor and a three month stint at El Celler de Can Roca, this world class kitchen has a supremely talented and dedicated leader. His delivery of Simon Rogan’s vision is faultless, and his passion for food in all its detail, is clear and beautifully communicated, despite the customary northern male’s lack of effusion. All that needs to be said is said, all that could be done for greatest excellence is done. The clean natural interior is comfortable, and offers no unnecessary distractions from the food. 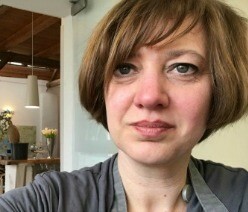 The restaurant is without pomp, there are no frills or even tablecloths. This place is all about the food and they know it. 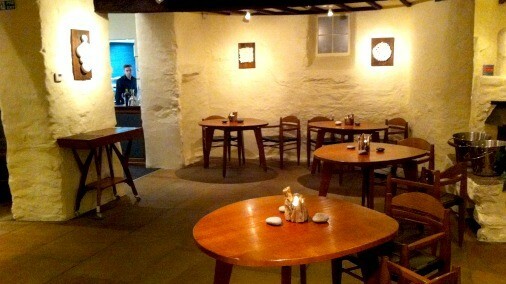 Having said that, the chairs are very comfortable, the tables spaced well apart, and all is calm and inviting. There is plenty of attentive service, but that is necessary to best deliver an experience that benefits from some information and focus. You could just pitch up and eat, without registering what you are being given, and have a relaxed and delicious time. 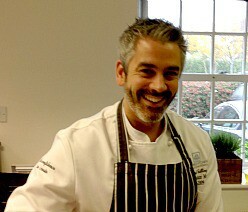 But that might be to miss something, and I was certainly very glad of more interaction with the front of house team. They were informed to a fault, and their knowledge and enthusiasm meant that no part of any dish was left unexplained if I wished it to be. Which is a great thing if you are keen, as I was, to glean every possible insight as I savoured each morsel. Apple marigold to open the meal. 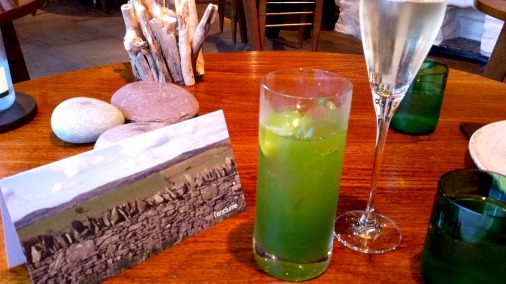 We kicked off with a drink, as we perused our menu cards. Dinner here is a tasting menu, a lengthy sounding twenty courses. Although that sounds a lot, and it is a feast of flavours, it is so well judged. You are by no means left hungry, but I have felt more full after three overindulgent courses. This menu is an exercise in unstudied elegance, and nothing is overplayed. Many ‘courses’ are merely bites, small in size, but tremendous in taste, and there to give maximum pleasure and variety to your palate. In keeping with their focus on English ingredients and specialities, we were offered a sparkling English wine from Henners in Sussex. My non-alcoholic alternative was an exceptionally delicious and refreshing cooler, also sparkling, but long and summery with ginger and lime enhancing the fresh, herbal quality of apple marigold. Not a herb I knew previously, now I love it! Redolent of green apple but grassy and delicate, it is the kind of little known treat from the English country garden that is the particular brilliance of all things at L’Enclume. The first bite to eat, the Oyster Pebble, combined the crisp, sweet, outer shell of a macaron with an interior of light cream, hinting at the fishy treat of the dish’s name. The green oyster leaf to eat alongside added its green touch, in colour, flavour and texture. Clever, tasty, a good opening. The next was a dumpling, mine beautifully light and fluffy, an intense hit of umami at its mushroomy heart, added to by the dried mushroom on top. The meat version was oxtail, and one of my companion’s favourite elements of the entire meal. Not eating meat I’m afraid I cannot give you insight into that aspect of the cooking at L’Enclume. Suffice to say that it was exceptionally well received, and is delivered with restraint and immaculate sourcing. You will not be hit over the head by a large steak here. But perfect delivery of the relevant succulent bits of English pig and its countryside companions are dotted through the menu in tempting ways. 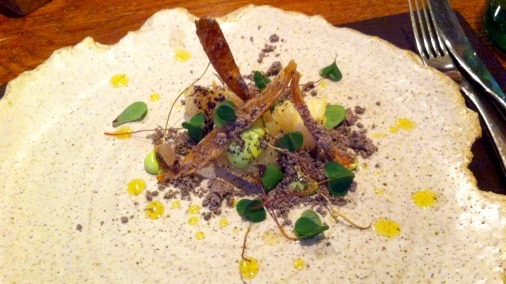 Ragstone, malt and tarragon, with the mushroom dumpling behind. These first bites are brought swiftly, to both sate and open the appetite. 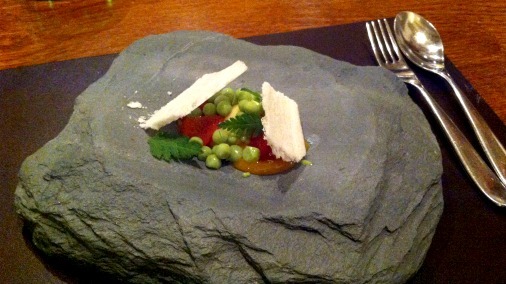 The Ragstone, an intense goat’s cheese, was there before I had turned to the dumpling. They contrasted beautifully, one hot, one cool, one comfort, one fresh, bright, herbal. What they both had in common was an intensity of flavour that stunned. This turned out to be my abiding discovery at L’Enclume, a quite exceptionally deep delivery of flavour, whether is be savoury, fruity, smoky or mellow, every mouthful is deeply felt, everything perfectly balanced. The edible soil, making this little ball of wonder look like something of the woodland, was made of malt, and was just the right earthy touch to complete this delectable mouthful. Crispy bread, capers and dill. A yuzu starch crisp, wonderful in texture, was spread with a sharp, savoury darkly caramelised caper jam, almost redolent of a great marmalade. Little creamy blobs of dill, and a few fronds of the fresh herb, completed another stunning morsel. There is deep earthy flavour note balancing this light and perfectly seasoned dish, the cool fish and bright acidity of strawberry vinegar sit atop caramelised cauliflower. Delicious. 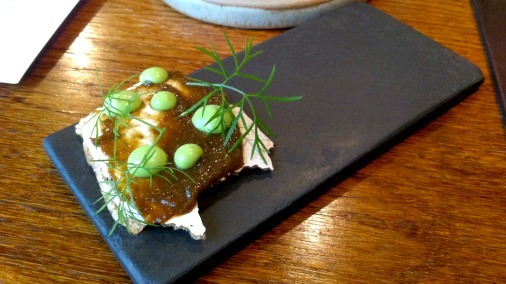 There is so much more to this pea and crab dish than meets the eye. Peas are whole and raw, their young sweetness perfect in their natural state, adding a pop of firm texture. There is also a pea mousse, creamily enveloping and unifying the other ingredients. The pea shoots are crisp, sweetly grassy, and echoing the other pea elements. An intriguing rubble of crunchy dried crab deepens the whole, with added texture, and with a gourmet reference to that most English of summer sandwich staples, fish paste. 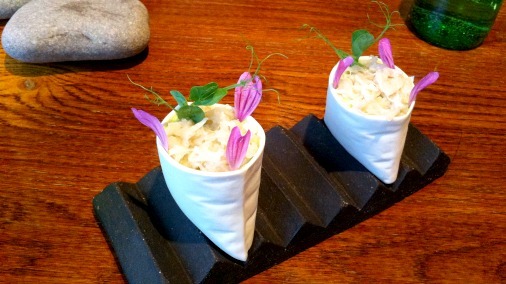 Delicate fresh white crab meat and mellow flowers round off a sack of treats. Creamed celeriac in Tunworth cream. Next another example of the kitchen’s brilliant use of fine English cheese. The warm tang of irresistible creamy Tunworth is in great harmony with little chunks of tender salt-baked celeriac, and lingers on the palate. 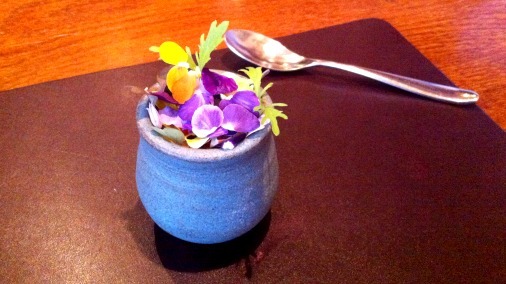 Blue jeans, violas, and the prettiest imaginable topping of flowers lighten this lovely comforting little dish. 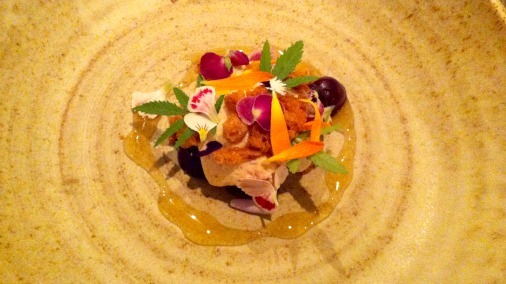 White turnip, maran egg, nasturtium leaves. Elevating the simple, the humble, breathing life into it and making you taste it fully, is another theme of this exemplary cooking. In this next dish turnip is enhanced brilliantly, and emerges a star. The bitterness of nasturtium plays off the natural bitterness of the root vegetable, while a creamy broth and the just-set yolk from one of their Maran chickens ramp up its comfort factor. The turnip is present salt baked, almost raw, and in the broth, in this beautiful hymn to its charms. Preserved tomatoes, currant blossom, shallot and Westcombe snow. Little rocks of onion sablé, cucumber flowers and leaves add texture, depth and opposite tastes to a delicious agri-dolce dish of flavour packed tomatoes, tangy cheese snow and sharp-sweet of dots of currant blossom gel. All things bright and beautiful. Malt bread with cracked rye, wholemeal with ale, white bread with onion and thyme. 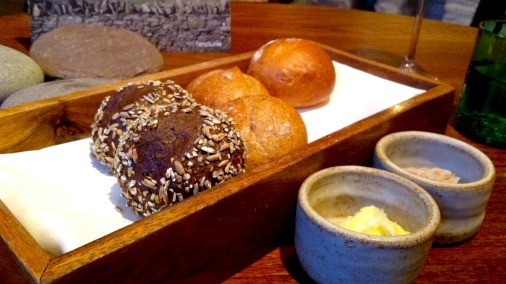 At this point the breads arrived, with whipped Cumbrian butter and some potted pork. All were very good, utterly fresh, yeasty and moreish. My favourite was the malt bread, reminding me of pumpernickel, which I have always adored since sharing it as a child with my Russian grandfather. Mark did tell me that he is working on a sourdough, to bring earlier in the meal. He is happy that it will retain sufficient freshness to last the meal on the table, something these three do not, in his opinion, hence their arrival at this point. That level of attention to quality speaks volumes! 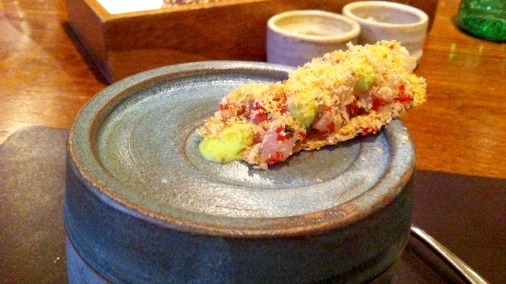 Raw langoustine, scurvy grass, hazelnuts. Next I was enchanted by langoustine, served in two stages. The first, above, combined the sweet, fresh tenderness of the raw shellfish, with scurvy grass emulsion. This green hit has a delicate horseradish quality, with gentle warmth. Toasted hazelnut atop, crisp linseed and sesame below, all amount to a familiar set of flavours. I was reminded of that chinese restaurant favourite, the prawn toast. And yet, here it was made entirely anew, into a light and heavenly mouthful. The second part of the lobster dish struck the most classical note in the meal. Glazed lobster on top of a carrot puree, dressed with a sabayon, had a more familiar style, seeming to reference French seafood dishes with their voluptuous richness. And yet this is a reference, rather than the full French treatment. 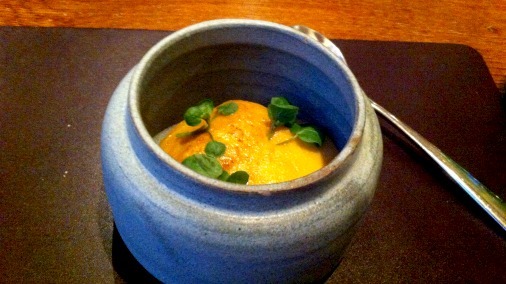 The lobster is heart-rendingly sweet and tender, the carrot puree has a complimentary earthy sweetness, the sabayon is rich, but delicate, and the watercress shoots inject a crucial burst of bitter and green. This is heavenly cooking, very indulgent, but in its size and lightness of touch, not overly so. 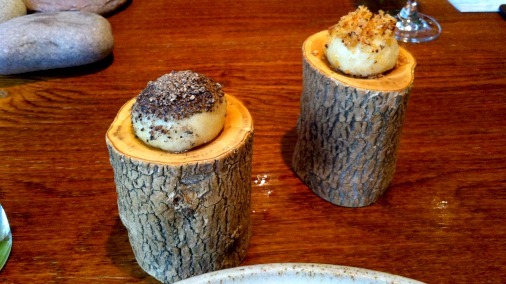 In a similar vein to the turnip dish, and yet utterly different, the humble potato takes centre stage here. Chunks of soft potato and deeply toasted skin are enhanced in every direction by the intense flavour of onion ash and spicy aromatic herbs. This is a very modern dish, and yet it comforts like the best potato curry. Quite startling. 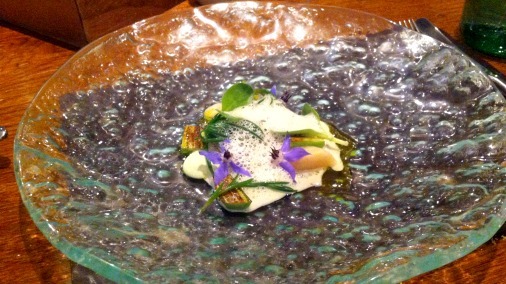 Grilled brill and cucumber, juniper, dill and razor clam. The newest dish on the menu when I visited, this fish dish is as summery as you like, a day at the beach with a BBQ. Perfectly cooked fish is garnished with the gentle salt of sea blight, and an ozone rich clam and cockle sauce. The hint of charring on the fish and the tiny charred cucumbers summon memories of BBQ. A gin and tonic is suggested by extra cool cucumber notes in the form of borage leaf and the warm spice of juniper oil. Butter poached hake, beetroot, leek, elderflower. The final main course, which was almost identical for the meat eaters but created with middle white pork, was a more land loving affair. 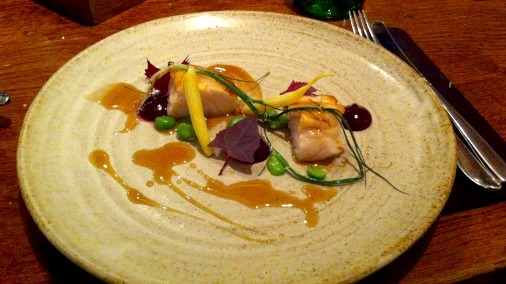 It spoke of the earth and the hedgerows, with grassy red orache leaves, deep beetroot puree, and the sweet crunch of a fresh beans. This all suited the hake to perfection, and the intense umami of the sauce, made with a fish stock, was rendered divine by the floral lift of elderflower. A shift to sweeter things is not a shift away from Simon Rogan’s clarity of vision. 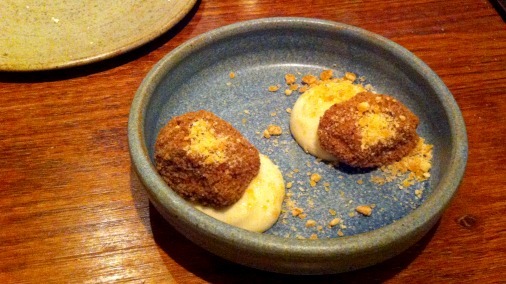 Pudding at L’Enclume doesn’t so much serve it as evoke it, and yet it continues to spectacularly deliver. You will not get a plate of something rich and stodgy, what you will get are a series of references to puddings past, and nods at puddings future. This first offering was a crisp little bite, delicate, only slightly sweet, with each element suggesting one aspect of a perfect gingerbread. The rye crisp and stout cream adding depth and bitterness, purple perilla a mint-like fresh lift and slight herbal quality. Blackcurrant and gingerbread powder add a depth and fruity flavour. This mouthful, a ball of toasted malt mousse, sitting on a mint cream and topped with hazelnut cake crumb, was like an ultra-light praline, nuts and malt keeping it grounded, mint cream freshening it up. Yummy! 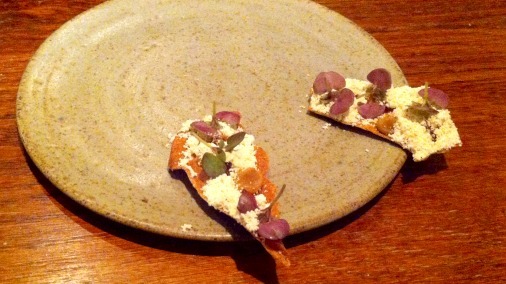 Gooseberry, sheep’s milk, anise hyssop. 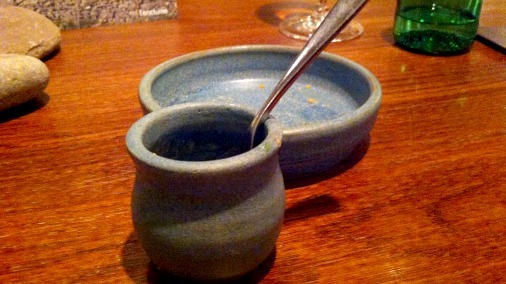 This little pot was so heavenly it was all gone before I realised I hadn’t taken any photos. The photo could not have done it justice. Whole, soft, fragrantly fruity gooseberries sat at the bottom within a little compote, this was topped by a delicately milky ice cream, on top of which sat the fresh green boost of anisse hyssop snow. Great gooseberries are a wonderful thing, these were the best, popping gently with bursts of flavour, balanced brilliantly with the other elements and the textural and taste contrast of toasted barley. Impossible not to adore this little creation. 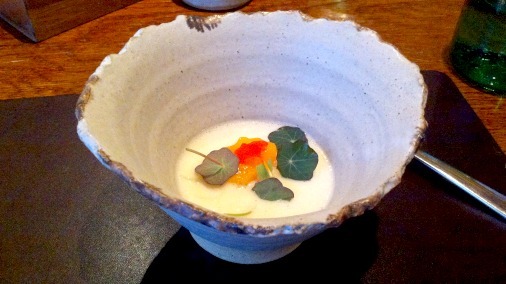 Buttermilk custard, strawberries, apricot and cicely. The milky warm caramel notes of buttermilk custard were brought into summer by exceptionally fruity strawberries, apricot puree and the delightful addition of ‘peas’ of sweet cicely ice cream and its fresh leaves. Sweet cicely makes a perfect pea, sharing a similar green sweetness. 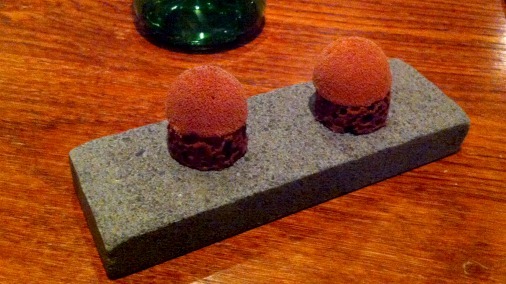 But these had the edge, especially for pudding, and melted deliciously in the mouth. Meadowsweet, cherries, cider and flowers. The final pudding was a pastoral English scene on a plate. Meadowsweet in name, character and ingredients. The lightest mousse, deeply fruity macerated cherries, the texture and earthiness of shards of walnut biscuit, and a garden of delicate flowers and leaves; violas, marigold, apple marigold. Completing this scene was a truly special cider reduction that hinted also at elderflower with its fragrant acidity and fruit. 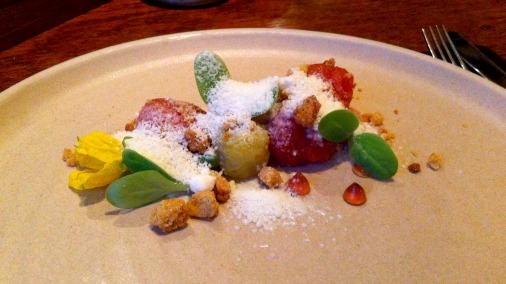 Apple, sweet cheese, pineapple weed. Iced tea. 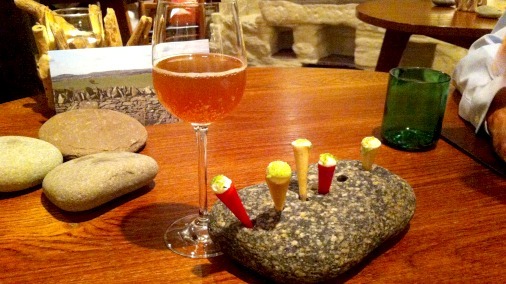 These mini-cones were a trio of ideas, an apple tuile with apple sorbet and tarragon sugar, sweet cheese ice cream with lemon in a raspberry tuile, and pineapple weed in a pear cornet. Each was distinctly different, each was bright and delicate, and a walk through an English country orchard with herbs growing at your feet. 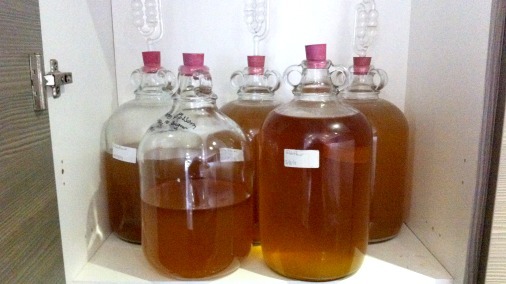 Alongside these was an iced tea, green and black teas fermented for two weeks. The result was slightly fizzy, amazingly fresh tasting, evoked the homemade ginger beer of my childhood, but wasn’t sweet and was instead deliciously cleansing. I ordered an infusion, loathe to end such a perfect evening, and this is what arrived! The trolley holds eight different types of mint, lemon verbena, lemon thyme, and apple marigold among others, all at their peak of freshness. A selection was picked according to my taste, and the flavour coaxed out of them through stalk bashing, rolling and chopping, before putting into a lovely individual stoneware pot and anointing with boiling water. The result was zingy with mint, lemon and a complexity of palate cleansing green. A little touch of chocolate! Chocolate! But the only hint of it, and I fear that this too is in danger. 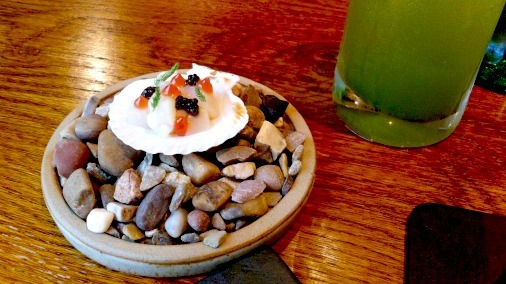 It doesn’t quite sit with the rest L’Enclume’s food. It was nonetheless clever, yet simple, and very nice to eat! A circle of aerated Amedei dark chocolate is topped with Kendal mint ice cream (Kendal mint cake being a local food speciality) which is then dusted with more dark chocolate. A brilliantly cool take on an after-dinner mint. And thus ended an evening not to be forgotten. The following morning I met up with Mark at Aulis, the new development kitchens on the site next to L’Enclume, in what was an old post office. There he talked me through his eight years in this beautiful Cumbrian village, and I took the opportunity to thank him for my dinner of the night before. Flagons of wonder, at Aulis. Aulis was more insight into the workings of this remarkable place. The sleek modern cabinets open to reveal sights that made me think of storerooms of my fantasy, things that would be at home in a larder from Roald Dahl’s Fantastic Mr Fox. Flagons and jars contain all manner of herbs, many I have never heard of, fermenting and infusing. 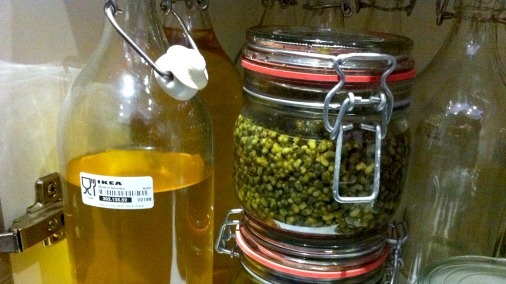 Vinegars and oils, teas, cordials and vodkas are being created. What a wonder of possibilities. Not able to keep my enthusiasm under wraps, I demanded to taste the contents of this jar. When Mark mentioned capers I was truly intrigued, I love capers, but had never tried these. Prepared like capers, these were made from buds of wild garlic. Much smaller than the conventional variety, they pack a considerable punch. Intensely bright in flavour, with full aromatic acidity and a green garlic hit, if I could have tucked the whole jar into my luggage home I would have done. A veritable garden of Eden. The following morning, after an excellent dinner at Simon Rogan’s more casual Cartmel restaurant Rogan & Co. I got going early and met Mark for the short drive to the farm. Nestled in between splendid hills, this beautiful and productive place is a key component in what makes L’Enclume’s ideas so fresh and food so delicious. It is a stunning palate of possibilities. 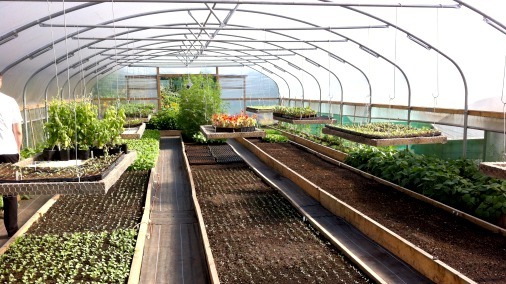 One of the polytunnels, order and bounty. 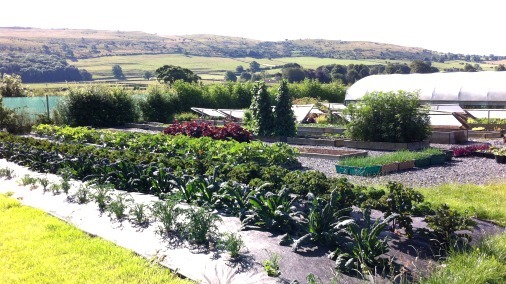 Everything is ordered, and a small army of happy looking gardeners busy about, tending, checking, and chatting to Mark about what is at its peak, what the restaurant can expect to take delivery of an hour or so later. The earth reveals a treasure for me. 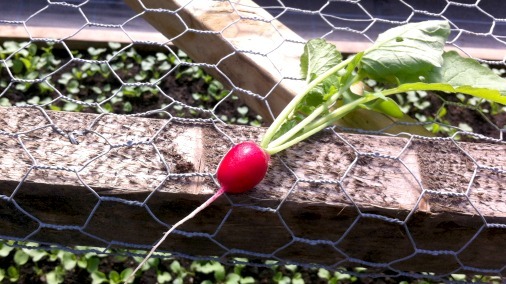 I have never tasted a better radish, combining ultimate crisp freshness, an unexpected sweetness and the perfect developing heat. 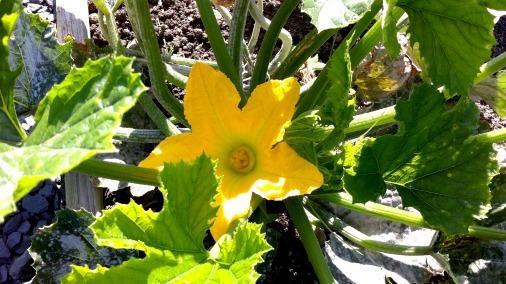 The bright beauty of a courgette flower. 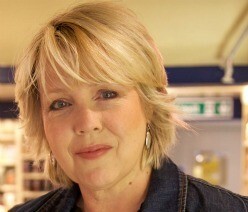 I found beauty everywhere, and Mark was truly alive with ideas for each and every herb, fruit, leaf and vegetable. 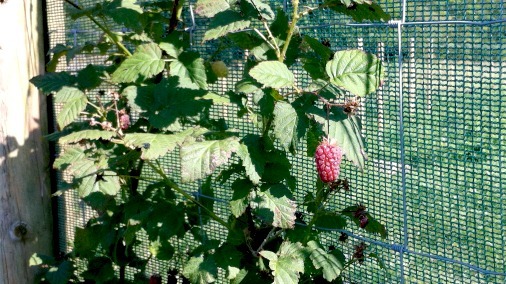 A tayberry, with potato plants beyond. Too tempting to resist, this luscious berry never made it to the restaurant. 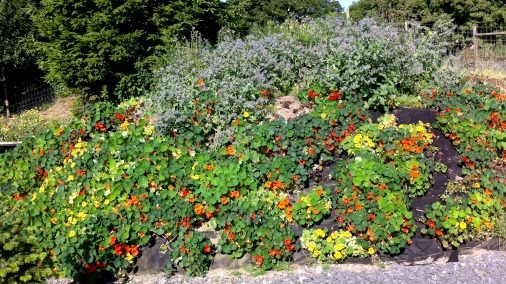 Apparently nasturtium’s grow most happily on a mound, where they can all reach the right amount of earth and sun. A car heading south awaited me, a blissful couple of days drew to an end. But as I sped away, and real life intervened, I could not stop myself reliving the marvels of this exceptional place. 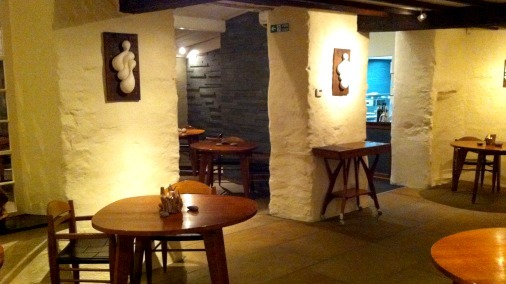 Cartmel is lovely, the restaurant’s rooms comfortable and welcoming, Rogan & Co is a treat, L’Enclume is an important and exciting destination. The whole experience is easy, informal, yet superbly serious where it matters. Simon Rogan has re-thought cooking and our relationship to those foods that surround us in a way at once startling and wholly natural. Quite a feat. I am already dreaming of my return. 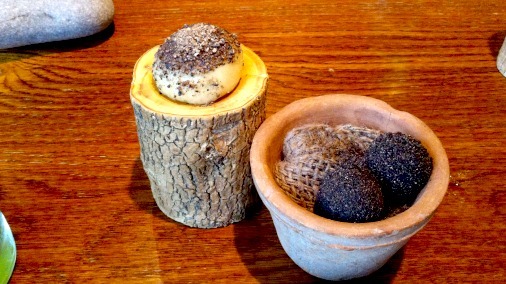 Thank you so much Mark, and all at L’Enclume, for giving me a delicious time!